Researchers from Bar-Ilan University in Israel and Michigan State University looked at 368 working mothers and 241 fathers who worked outside the home. Turns out, the women were on overdrive, with some even describing the hours between 5 and 8 p.m. as the "arsenic hours." 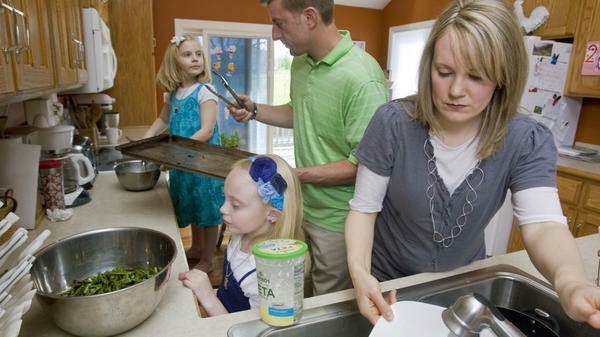 "The first thing they had to start worrying about is getting dinner, interfacing with their kids, getting done all the housework chores," says sociologist Barbara Schneider with Michigan State University, who co-authored the study. "You could see from the data all the stresses and strains they felt as they walked in the door, and all the tasks" they felt they had to accomplish during those early-evening hours. The working parents in the study wore watches that beeped randomly seven times throughout the day. Researchers wanted to know how much they were multitasking. So, after the beep, the men and women filled out forms that described what they were doing, what "else" they were doing, and whether they were happy, stressed or wished they were doing something else. After gathering all the information, the researchers found that working mothers spent 10.5 more hours every week on multitasking compared with working fathers — typical chores like preparing dinner, doing laundry, maybe even doing some work brought home from the office, while also talking with their child and helping with homework. Fathers, on the other hand, did a different kind of juggling. "When they're multitasking, it tends to be more work related — so they might be answering a work call" while spending time with the kids, Schneider says. As a result, Schneider says, the women reported much greater feelings of stress and being overwhelmed than the men reported. The men reported feeling pleased with their multitasking. Psychologist Russell Poldrack, of the University of Texas at Austin, studies how our brains make decisions and process information. He says there's a big difference between multitasking in the short term — answering the phone while driving, for example — versus multitasking over a number of hours, like the mothers in this study. These mothers were likely overloading their "working memory," he says. "Our brains can only hold so much information in working memory, and when we get overloaded, a different set of systems turns on in the brain — chemical systems that are actually related to the stress response," says Poldrack. "And the neurons in our prefrontal cortex lose the ability to hold information in the same way that they can when we're not stressed out." Understanding the biology behind being frazzled may not be much comfort to the average over-stressed working mother. Which is why researcher Barbara Schneider suggests some big changes. While men in the study worked longer hours on the job outside the home than women, Schneider says, employers could be more creative in scheduling, giving men more flexible hours and more time at home so that child care and household chores can be more equitably divided.